The High Quality Miniatures Game Takes Players into the World of AMC's Hit Series with Never-Before-Seen Cooperative Gameplay. The game redefines the survival horror genre with gameplay that emulates the group dynamics from AMC’s The Walking Dead. How will you cope with the stresses of leadership when the walkers find your ragtag group of survivors? 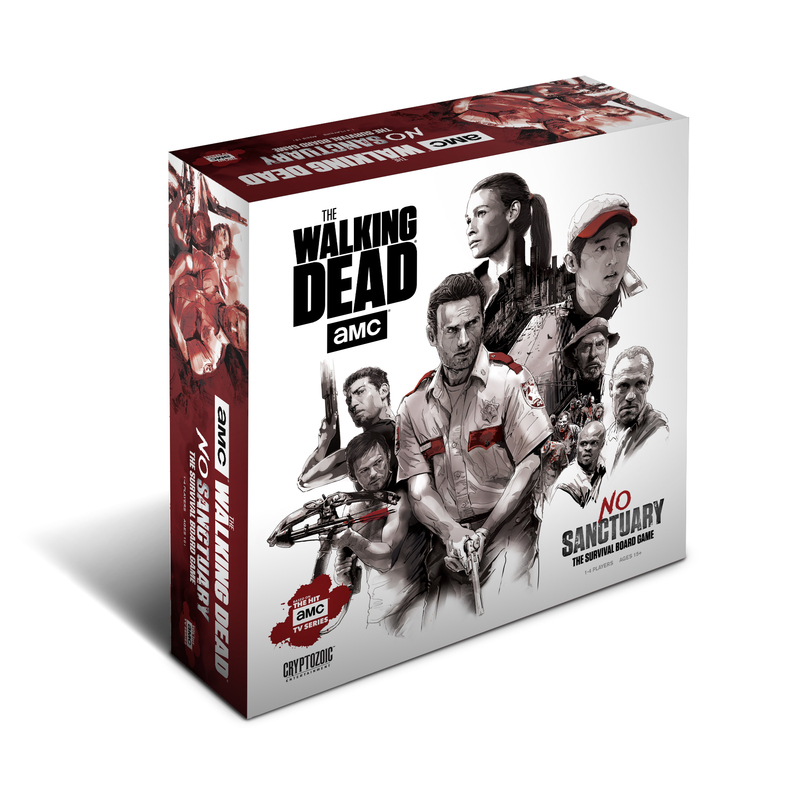 Cryptozoic Entertainment (cryptozoic.com), leading creator of board games, merchandise, and collectible cards, in partnership with AMC, is proud to announce today’s launch of the Kickstarter campaign for The Walking Dead: No Sanctuary board game. The game redefines the survival horror genre with gameplay that emulates the group dynamics from AMC’s The Walking Dead, as one player acts as the leader while the other players decide whether to support or defy their leader’s decisions. Working together is vital to winning as a group, but players have their own motivations that they cannot share with the others, making survival in a world of walkers a heart-racing challenge. Favorite characters and scenarios from the hit AMC show all appear. 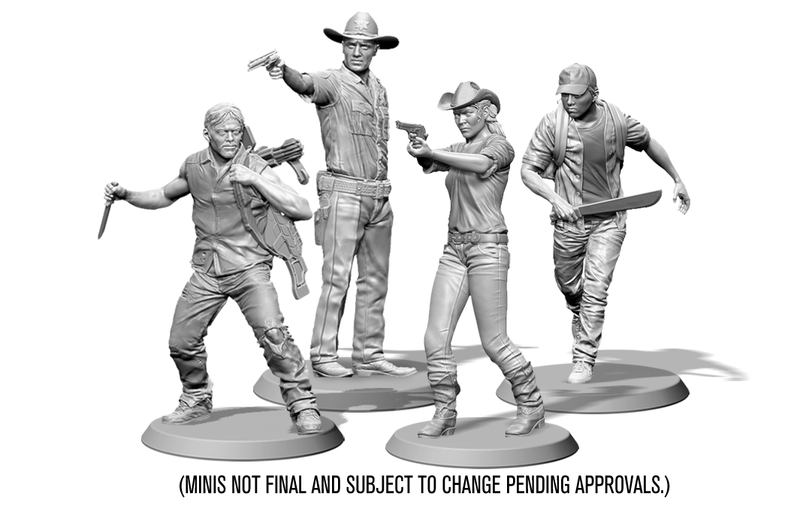 Expect to see miniatures based on the characters played by Andrew Lincoln (Deputy Sheriff Rick Grimes), Steven Yeun (Glenn Rhee), Laurie Holden (Andrea Harrison), and of course, Norman Reedus (Daryl Dixon)! The co-op game allows 1-4 players to enter the show's world and take on a multitude of different enemies—both dead and alive—all with their own distinctive motivations and ways of moving around the board. The encounters and actions of characters are taken directly from episodes of The Walking Dead. Playable characters are completely unique from one another and have abilities that can only be shared if they are trusted by other survivors. The game has a truly original leadership component: Each player gets an opportunity—or in some cases is forced—to lead at least once each game, constantly altering the team's strategy. Defying the leader’s approach to a situation will add to his or her stress and cause other characters to lose trust, lowering everyone’s morale. If morale falls, all the survivors are in serious danger. 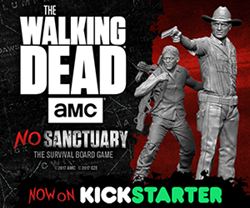 This is the miniatures game The Walking Dead fans have been waiting for, with over 30 highly detailed and realistic walker and survivor figures. Survivors come with their own character boards and decks, allowing them to perform abilities that reflect their personalities from the show. Gameplay utilizes over 200 printed cards—including Event Cards, Search Cards, and Location Cards—that create varying scenarios in conjunction with the 12 double-sided map tiles, which highlight memorable areas from the show. The game also comes with over 100 tokens and 10 custom dice. Founded in 2010, Cryptozoic Entertainment, Inc. is a premier developer and publisher of original and licensed board games, card games, comics and trading cards, including the DC Comics™ Deck-Building Game, The Walking Dead™ Board Game, The Big Bang Theory: The Party Game, and Ghostbusters™:The Board Game, one of the most funded tabletop games in Kickstarter history. Following a philosophy and core principle of "Fans First," the dedicated gamers and fans of the Cryptozoic Entertainment team are focused on producing fun and amazing products along with epic events that bring all gaming fans together as part of the Cryptozoic community. Visit http://www.cryptozoic.com for more information about product releases, events and news. Based on the comic book series written by Robert Kirkman and published by Image Comics, The Walking Dead reigns as television’s most watched drama for adults 18-49. It tells the story of the months and years that follow an apocalypse , as a group of survivors—led by police officer Rick Grimes—travel in search of a safe and secure home. The series, which has been heralded by critics as “an honest-to-God phenomenon” (Variety), “relentless and provocative” (Orlando Sentinel) and “brilliantly engaging” (TheHollywoodNews.com), is executive produced by showrunner Scott M. Gimple, Kirkman, Gale Anne Hurd, David Alpert, Greg Nicotero, and Tom Luse. The series returns for its seventh season this October on AMC.